There are so many styles and designs, it's hard to know which one is best. The Saddle Rack-Stand does more than just provide a place to keep a saddle. It also helps the saddle maintain it's proper shape and provide space for other related tack such as bridles, halters, cinches and grooming supplies. But what kind of Stand-Rack do you need? There is a great variety available these days. They can be made of wood, aluminum, or metal such as steel. There are two basic styles which are either free-standing or wall-mounted. One of the first considerations in purchasing a Stand-Rack is to consider it's intended use. Do you need a permanent place to store your saddle, or a temporary place when traveling to shows? For temporary storage, folding saddle racks made of aluminum are wonderful since they take up very little space when folded, but provide a very sturdy stand when in use that are unlikely to collapse under the weight of the saddle. Likewise wall-mounted racks that fold down while traveling are also extremely convenient. But these are not meant for long-term storage. The most important consideration for long-term storage is the shape and height of the stand/rack. Wood and metal stands, including those that will hold multiple saddles, should be the proper shape to properly support the saddle tree, and high enough to keep the stirrups off the ground so the fenders and jockeys are not bent. English Saddles do very well on a single bar style since the gullet travels the entire length of the saddle and the tree is extremely small. The saddle balances very well on the bar without bending the fenders. English Saddles also do very well on rounded top wood stands since the fenders are held at a very natural shape. Western Saddles need to have a more angular surface to properly support the tree. The stand must also be wide enough so the fenders and skirting do not begin to curl and lose their shape. Multi-tier metal stands should have flanges angling down on each side so the tree is supported, the saddle is balanced on the rack, and the fenders and skirting are supported. Wood Stands can be both a beautiful piece of furniture, and a functional saddle stand. If the stand is built with an angular top, much like an A-frame, the tree will be properly supported to allow a full-grown adult to sit on the saddle. Wood stands are very popular in saddle and tack stores since they look beautiful, yet will hold up to many years of customers testing saddle fit and comfort. Wood Stands should have spaces between the slats to allow the saddle and/or pad to ventilate any moisture that accumulated during riding. 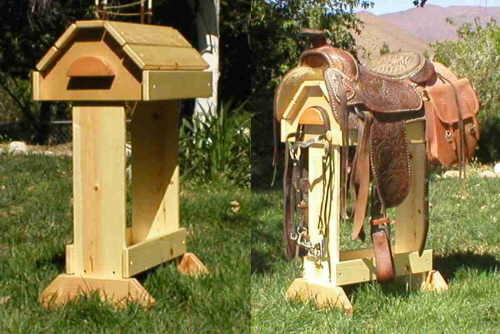 Rounded top saddle stands are not recommended for Western Saddles. The roundness tends to apply pressure to the tree and can also cause an outward flaring of fenders, jockeys and skirting. Additionally, it is not recommended to sit on a saddle on a rounded stand since it is much more likely to slip from side to side. Many stands are designed with a Bridle Rack on the front. This often over-looked item is both decorative and convenient, but also needs to be chosen wisely. The Bridle Rack needs to be a broad round shape, much like a half circle. If the Bridle Rack is a simple post, or has a pointed top like a triangle, the leather of the bridle is going to crack rather quickly. We have considered all of these factors in the design and engineering of our line of Rustic Pine Saddle Stands!